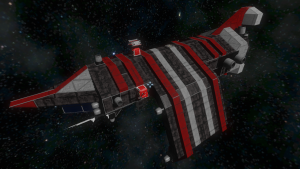 The Argentavis is a pirate carrier that appears in the manner of a cargo ship. It is a formidable opponent, having the capability to spawn multiple distinct types of drones, but carries a substantial quantity of components should one successfully disarm and board it. The ship is not booby trapped as it's expected to follow players and be mobile, which makes it seem much more threatening. Additionally, the Weapons Platform Missile is theorized to exist, but has not yet been observed. Be aware that the drones will not fire through one another or the Argentavis to hit the player. 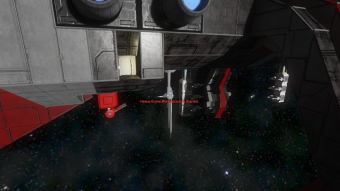 Disabling or destroying the antenna on the Argentavis' belly labelled "Heavy Drone Manufacturing Started" will prevent it from creating new Dyads; the antenna marked "Raid in Progress" underneath its cockpit controls the spawning of Barbs. Once these antennas are disabled and all existing drones have been destroyed, an engineer can approach the Argentavis from directly behind, and (being careful to stay close to the hull) gain entry safely through either side airlock, located beneath the left and right large thrusters. 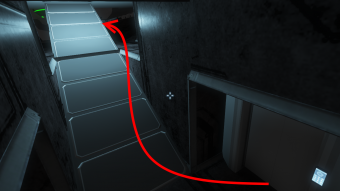 After gaining access to the interior, one will see a ramp that leads up to a catwalk and a floor. Walking up this ramp and onto the solid floor would allow one to disable the ship's reactor without provoking its interior turrets. Once this is accomplished, the ship's armaments can easily be disabled to allow it to be piloted to a base for refitting or destruction, or it can be refitted or dismantled on the spot if the engineer is equipped to perform these tasks. Another way to enter the Argentavis, is to come in from the back, grind your way in, find the first airvent at the small passenger room; "Hack it" and in the 'Control Panel' mark and set all blocks to "Owned by: Me" and the Ship's yours to keep. Cut the power to disable the Argentavis' weapons and its spawning capabilities. This seems to require destroying the reactor and not merely disabling it. Ensure that you have a clear path to the outside, such as the point through which you entered. If you closed your entry point, make another hole, but be careful not to exit yet. Additionally, be sure that you make your hole away from any drones, so that they do not shoot you as soon as you finish. Finally, be careful that the ship, if pressurized, will vent, and it is vital not to be blown out. Walk as far from your exit point, inside the ship, as you can. You should see the drones moving around the Argentavis towards you. Wait for them to get as close to you as they are going to. The farther you can get them from your exit point, the better. Get to your exit point, as fast as you can, and exit, keeping the Argentavis between you and the drones if at all possible. Get out of weapons range (800m) of the drones as fast as you can. Voila! Safety! You should probably declare a GPS point here if you plan on going somewhere to pick up reinforcements. It'd be a real shame to go to all that trouble and then lose the ship. Has 2 Cryo Chambers, in the back medical quarters and a Medical Room. Has 2 Assemblers along with 2 power effeciency upgrades and 2 effectiveness upgrades, these functionally do nothing. The Welder array in the 'belly' of the ship, is actually completely non-functional lacking a projector and any blueprints to actually build ships. Instead it relys on Antennas to spawn drones, this often leads to the confusion of many players. Has 2 Programmable Blocks which are controlled by 3 Timer Blocks, the scripting tells the Remote Control to follow a player at 3 minute intervals. Remaining at 5000 meters away and doing nothing if a player happens to be within 4000 meters. After two iterations of the Leaving script which takes 1 hour and 40 minutes, the Argentavis remote control block clears all remaining way points previously set. Set's a new one far 50,000 meters away from its current position and 'leaves'. Has 5 Gatling Turrets. Two are located under the ship covering the belly and the "welding assembly". Two are located at the front near the bridge covering both sides separately and the front. While one is located at the top of the ship covering all approaches from the top and forward. Has 1 Missile Turret located on the top, heavily defending the approach this way. Has 5 Interior Turrets scattered inside the ship each with 800 or more magazines of ammunition. Has a fully functioning Jump drive, in the medical quarters. The Bridge is located at the Bow or front of the Argentavis, it provides a wide range of vision which is very exposed to enemy fire. This bridge is protected by 3 Interior Turrets and a series of airtight hanger doors curiously these doors always seem to be open negating their entire purpose. Inside the bridge itself, there are four Control Stations, one of the three Interior Turrets, the two Programmable Blocks and the Flight Seat which is the main cockpit controlling the thrusters and etc. The Argentavis has 16x Gyroscopes to aid in maneuvering. A Large Reactor with plenty of Uranium Ingots is located deep within the middle and center of the ship, a well placed torpedo or two could make short work of the Argentavis disabling its defenses and stopping more drones from spawning in. The ship's interiors are fully pressurized with 6 Air Vents, with two airlocks serving as primary entrances. There are 2 Oxygen Tanks and 2 Oxygen Generators, well stocked with Ice. A fully functioning gravity generator is located on the roof near the Assemblers, positioned upside down. The internals of the Argentavis are all conveyor accessible, however the ship does not have any Connectors or Collectors. This implies the ship is not expected to actually be able to transfer cargo in any port. Has 2 Antennas labeled with "Raid in Progress" and "Heavy Drone Manufacturing Started", along with a Beacon that gives the ship it's name labelled "Argentavis". The single Remote Control block responsible to navigation and maneuvering is located deep within the aft of the ship, it's located near the red interior light named "personal quarters". It is positioned directly below and behind the heavy armor block under that light. Additionally, 10K* Ice and 6 Oxygen Bottles are available from the two Oxygen Generators, and a total of 4,200* 5.56x45mm NATO Magazines are found in the five Interior Turrets. * Depending on your engagement of the Argentavis, its stock of these items may be depleted somewhat. The Argentavis, two Dyads and a Barb, viewed from a fully-zoomed camera just outside of its weapons range. 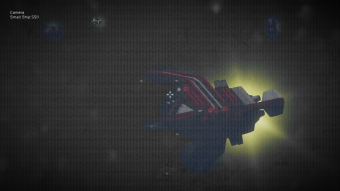 Some of the image has been de-saturated to make ships more visible. The recommended entry door and the location of the Dyad-spawning antenna. 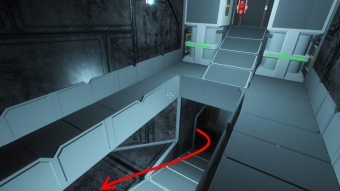 The interior side of the entry airlock, the turret to be wary of when boarding from this direction, and a route that allows one to gain access to the main floor without provoking said turret. Another view of the previous image, showing the entry door, suggested path, and main reactor at the top of the ramp. This page was last modified on 28 December 2018, at 15:24.